Commercial and residential waterfont construction calls for the specialized knowledge and experience of a marine contractor. When your building plans include marine structures, call the local experts at Decks on the Lake. Located in Montgomery, they can be reached by calling 936-448-4934.Decks on the Lakecan send someone out to your property to give you a free, no-obligation estimate on the building or repair job you want done. When you contract with us, you can be sure we will complete your job as quickly, efficiently, and cost-effectively as possible. Our supervisors and skilled workmen are proud of the fine work they do and the exellent reputation they have earned in the area. We can provide plans and designs for any marine structure, or we can work with your ideas and plans. Whatever your marine construction needs this season, we are the company to call.Decks on the Lakeis fully insured and licensed and has the experience and expertise that you can count on. We invite you to contact us for a free extimate or for further information. 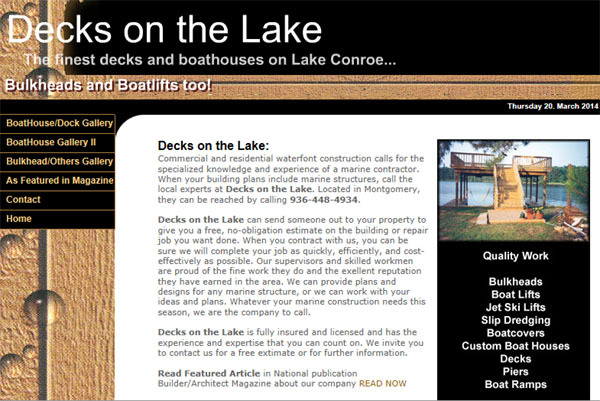 Based in Lake Conroe, Texas and established in 1990, Waterfront Construction specializes in boathouses, decks, custom carpentry and fabrication of boat and jet ski lifts. The Boat Lift Company is your single source for all of your mooring and boat storage equipment.